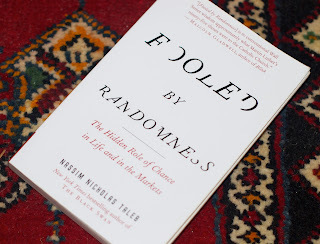 Fooled by Randomness, by Nassim Nicholas Taleb, is a disturbing book. It asks questions we don’t want asked and hear answers we don’t want to hear. Mr Taleb is an investor, par excellence, but an investor with a twist. He despises risk and takes every caution to avoid it. But, wait a minute; is this a book about investing? Yes and no. Part of the book uses examples from the world of stocks and bonds, but much of it does not, and every bit of it applies to your life and mine. How about this question: Does your boss talk utter nonsense? Your favorite politician? Let’s separate meaningful sentences into two categories, deductive and inductive. Deductive would be something like: Two plus two equals four. From the inputs flows the answer. In the case of inductive sentences, there is more room for discussion. It rains in Spain. Really? A lot or a little? All over Spain? How do you know it rains in Spain? Taleb examines the inductive side with something called the Dada Engine, which can be used to generate grammatically sound sentences that are meaningless. How can you tell the difference, if the statement is inductive? Taleb goes into some detail about how random bits can be strung together to mean nothing, but sound elegant. He didn’t need to use the engine. We get random gibberish everyday, from multiple sources, most of whom are in positions of authority. But, you say, “This guy has a great record of predicting which stocks to buy. He predicted the stock of X, Y, and Z companies would go up. They all did!” Taleb easily explains this and the answer will stupefy you. Taleb doesn’t stop there. He brings probability to the real world, such as the O.J. Simpson trial and life expectancy. Taleb doesn’t read the newspapers anymore, or watch the news on TV. Why? Too much trivia, misinformation, and downright ignorance of probability. Newspapers and TV upset him. As humans, there are a couple of things we can’t do, rule out emotions, and consider all the possibilities. When we experience bad luck, which Taleb might call the probability of failure, we only consider that we could have had good luck, or better luck, not that what happened to us was on the upper scale of all the bad that could have happened. And, how can we control our emotions? Truth is, we can’t really. But, we can mollify the effects our emotions have on us. Don't watch the news. Don’t check stock prices everyday. Read this book. It makes you think and it’s good for investments, but it’s better for the soul. I was doing all right with Mr. Taleb until this: "Taleb doesn’t read the newspapers anymore, or watch the news on TV. Why? Too much trivia, misinformation, and downright ignorance of probability. Newspapers and TV upset him." That leaves me to question where Mr. Taleb finds facts. Without facts, upon what does he base his reason? Is he blessed with divine insight? Admittedly some newspapers, TV and Internet sources might be wrong, trivial or ignorant, but when I discount those, where then do I look? Don't be put off by the lack of TV and newspapers. Pages 293 to 306 are the the finely spaced references used in writing "Fooled by Randomness." Flip to the 'About the Author' page and prepare to be impressed. Not talking solely about degrees, but about where he has taught, and more importantly what he has done in the business world. What he writes about he has studied, researched, taught, discussed with colleagues, and used in a practical sense. Really good book. I'm with Mr. Taleb in avoiding news for some of the same reasons. However, I haven't reconfigured AFN. I'm taking a break from TV. I also agree with his premise or thoughts on inductive and deductive, but it seems too pat. Too sterile. So, I'm going back to the first post I found on Randomness because I believe MOST of life is not planned, but accommodated. Look, my Blogger post here is defunked. If you'd like to read what I have lately penned then go here: Mango Sherbert or http://open.salon.com/blog/mango_sherbert. I think you should consider parallel postings in Open Salon because you will get more readers and you have such a clear worldview I think you'd be published in the online magazine- plus have tons of followers. Give Jane a sweet Gabi like hug for me. Finally, don't you enjoy writing? I do too! Hi there, You've done an excellent job. I'll certainly digg it aand personally suggest tto my friends. I'm confident they'll bee benefited from this weeb site.